I was an Artist in Residence at spacecraft company, Planet Labs in 2015. It was an incredible honor to work among such brilliant and passionate people. Planet has a mission of imaging the entire Earth from orbit every single day with their "Dove" satellites. So, for the residency, I wanted to make portraits of people who helped lay the foundation for viewing and understanding the Earth from such a wide angle. It was important to me to make drawings from historical photographs, mainly to expand my portfolio beyond cartoon robots and cephalopods. I also wanted to create more research-driven artwork. In digging up these photos, this series enabled me to learn connections and strange facts that I wouldn't have found on my own unprompted. In the process, I learned some fascinating bits of history and discovered new techniques for creating an etched engraving look in the work. In researching influential people in the various fields of Earth imaging, I learned about cartographer Marie Tharp. Marie and her colleague Bruce Heezen worked together to map the ocean floor throughout the 1960s and 1970s. Marie Tharp discovered the Mid-Atlantic ridge which confirmed the theory of plate tectonics and insured her place in the history books. However, I had never heard of Tharp and maybe you haven't heard of her either. It turns out that she was featured in an episode of the new "Cosmos" as an animated character. There is also a book about her life called, "Soundings" by Hali Felt. Buried in the book is a small reproduction of a photo booth strip taken sometime in the 1970s. I've decided to recreate the strip as a series of drawings. Tharp was publicly recognized late in life and she died in 2006. My hope is that this strip will someday be etched onto a Planet Labs Dove spacecraft and flown in orbit to honor Marie Tharp and her contribution to illuminating the Earth for everyone. The conference rooms at Planet Labs are named in honor of various figures that have made significant scientific or humanitarian contributions. I was happy to see that Malala Yousafzai had a room named for her. Malala is an advocate for women's education, a survivor of Taliban brutality, and an eloquent role model for young people all over the world. When tasked with the challenge of creating portraits for the Planet Labs' offices, I was excited to work on the Mahatma Gandhi room. I think everyone has a clear idea of what Gandhi looks like when they hear his name from either photographs or portrayals by actors in film. In researching photographs of Gandhi, I found some very interesting portraits of him as a young man. 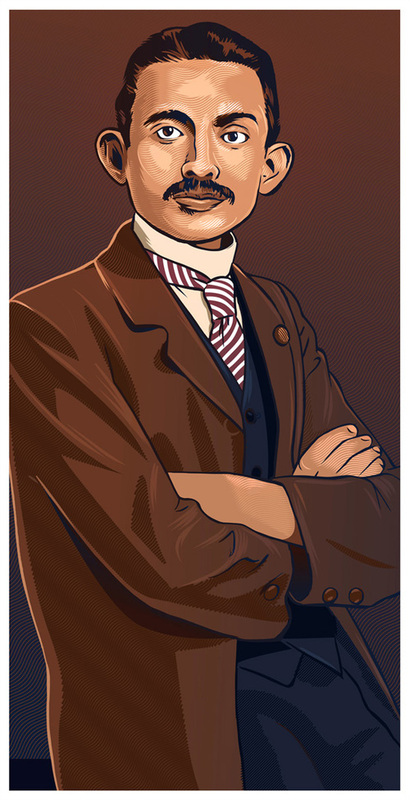 This drawing was created from a photograph of Gandhi as a young lawyer and civil rights advocate in South Africa. Special thanks to Forest, Rachael, Uzi, Alvaro, Jon, Kelly, Tony, Pete, Dawn, Danielle, Nicole, Sam, all of the different Roberts, Will, Chase, Ming, and everyone else at Planet Labs for being so supportive and encouraging. I'll miss being there everyday.